ATP’s Technifit™ Line of push-to-connect fittings features three series’ which includes; Resin, Nickel-Plated Brass, and Stainless Steel. Push-to-Connect fittings are designed to connect by simply inserting tubing into its port. This method is a more convenient alternative to hose barbs and clamps or compression fittings. The Nickel-Plated Brass Series is constructed of…Nickel-Plated Brass. This combination offers increased working pressure and some differing chemical resistance characteristics compared to resin. The nickel-plating also provides an easier method of cleaning in some environments. 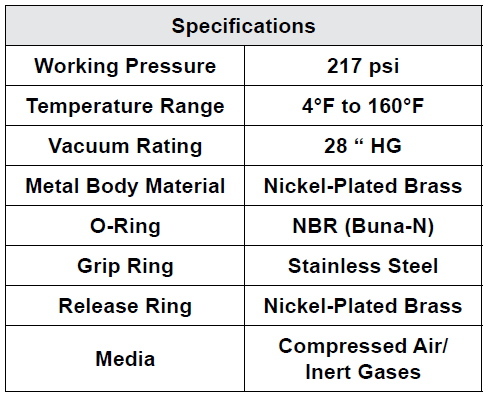 The Nickel-Plated Brass Series is compatible with compressed air or inert gasses and provides an increased working pressure of 217 psi.